Because I’m always way behind regarding books, movies, and television shows (I tend to get around to watching stuff during the third season or, more often, after the series finale), I just finally read THE GOLDFINCH by Donna Tartt. In case there’s anyone out there more behind the times than me, THE GOLDFINCH won the Pulitzer Prize for Fiction in 2014. 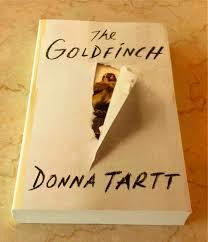 It’s Donna Tartt’s third novel and weighs in at 771 pages (296,582 words). I really liked this book. While it felt overwritten in places, it absolutely held my attention. I cared about thirteen-year-old Theo Decker, and continued to care about him as his story spanned the next fourteen or so years of his life. I learned interesting things about antiques and Dutch painters and the body’s capacity for drug and alcohol abuse. This story drew me in so much that I neglected my own writing for several days. I told Zippy that reading THE GOLDFINCH felt like one of my Netflix binges. Again, it’s quite possible I’m late to the party here (I know that dissing children’s literature is fairly common.) But his comments are very interesting in light of a book I read last night right before going to sleep. 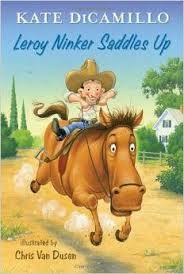 LEROY NINKER SADDLES UP is 90 pages long and contains 5,972 words. I loved this little book. I cared about Leroy Ninker and his horse Maybelline. And as with THE GOLDFINCH’s secondary characters, I got a very good sense of the people in Leroy’s life. I understood who they were and what they were about. Leroy’s character arc was complete and satisfying, and I rooted for him the whole way. I was engaged in his struggles and kept turning the pages to find out what happened next. Kate DiCamillo made this possible in fewer than 6,000 words. Adult literature is one thing and children’s literature is another separate entity, except when its not. The truth is, they’re both about story. And sometimes you need 300,000 words to tell that story and other times only 6,000. All that should matter is whether it’s done well.